You can use an electric engraver on stone, glass and ceramic surfaces. Engravers use diamond tips to etch hard surfaces to create patterns and designs. 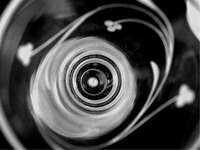 Place your black and white picture or pattern you wish to trace underneath the bottom of the glass plate. Tape it securely to the plate. Choose and attach the appropriate-width tip to the engraver. Use a very thin tip for outlining a pattern and a wider tip for shading. If it's a very large design, you can use a wider tip for outlining and an even wider tip for shading. Grasp the engraver like you would grasp a pen and hold it at about a 45- to 75-degree angle to the surface you wish to engrave. Turn the engraver on and trace the outside of the pattern onto the plate with the tip of the engraver. Work from the outside of the pattern in an inward direction. Press down firmly when outlining a pattern and press more lightly, using a wider tip, when you are shading. Remove the pattern once it has been traced and replace it with black felt for contrast. Continue engraving and shading the inside of the design, wiping away the debris as you work with a soft cloth. Practice on a piece of scrap first until you get comfortable with the engraver. If you hear a squealing sound, you are pressing down too hard with the engraver.